This is a lovely moss stitch, simple pattern for baby mittens that are adorable, actually stay on their chubby little hands, and they are reversible! 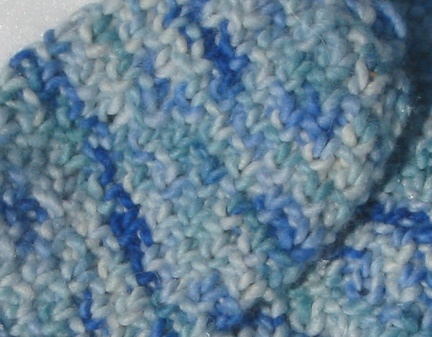 On size 5 needles, cast 24 stitches on 3 needles (8,8,8) and join in a circle. 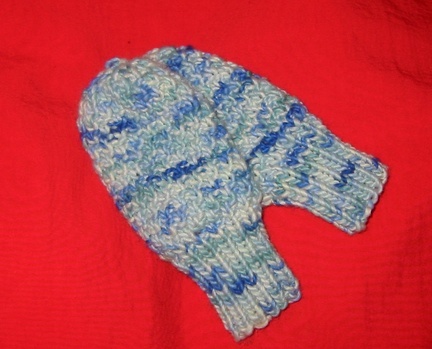 K1P1 for 2.5 inches, creating the wrist of the mittens. *k3 M1* repeat to the end of the row. You should end up with 32 stitches on your needles. Repeat rows 1-4 until you have 6 inches from cast on edge. Then *K2tog P2tog* repeat this pattern until you have 4 stitches left. Cut yarn, leaving 6 inches of tail. Weave tail through live stitches and pull snug. Tie off and weave in any loose ends. These are so cute!!! 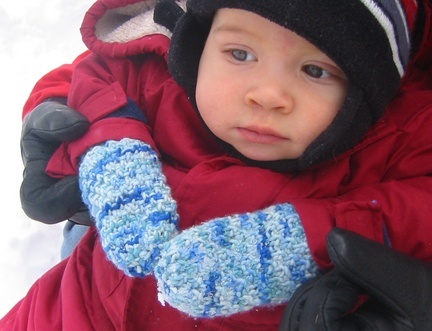 Plan to make several pairs for we wee ones in the fam.